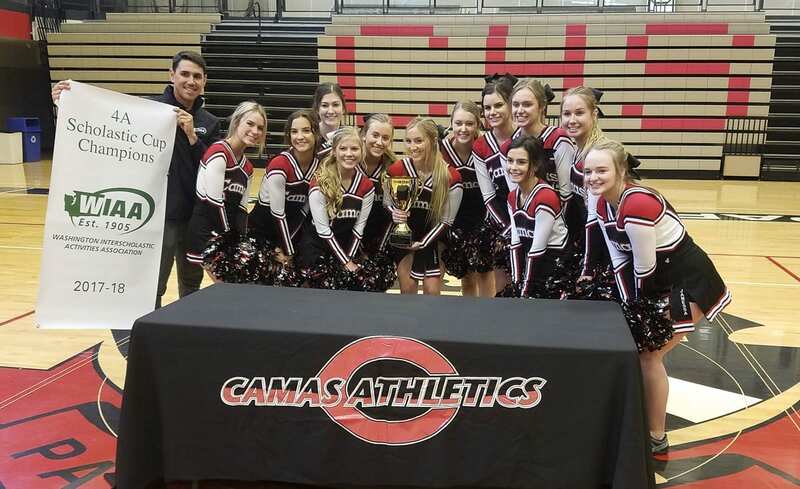 CAMAS — It is official: Camas is the best Class 4A school in Washington. At least according to a scoring system used by the Washington Interscholastic Activities Association. Andy Knapp, the director of marketing for the WIAA, was on campus Thursday afternoon to present the Papermakers with the Scholastic Cup. The Cup, which the WIAA considers its most prestigious award, goes to the top school in each classification based on points for athletic and academic achievement as well as sportsmanship. Camas had state championships from gymnastics, boys swimming, and boys track and field this school year. The Papermakers also has several other top placings in team standings. Many teams scored points for academics, as well, with boys basketball, boys wrestling, and boys soccer all finishing second in the state in their sports. For Knapp, this was an extra special presentation. He is a 1999 Camas graduate. His grandfather graduated from Camas in 1939 and his dad is a 1969 graduate. His mother was the school’s librarian for 29 years. “Papermaker pride runs deep,” he told the students at the ceremony held just after school Thursday. When Knapp was in school, Camas was just starting to get strong in some sports. Now, Camas is a Southwest Washington powerhouse. Knapp joked that he believe it all started to turn around for the Papermakers when the 1999 boys golf team won the state academic championship. You can guess which sport Knapp played. Some 19 years after he graduated, Knapp returned to Camas, representing the WIAA, and awarding the association’s top honor to his Camas Papermakers. Top 10: Columbia River finished ninth in the Class 2A Scholastic Cup standings. The Chieftains were led by the state champion boys soccer team. The girls soccer and girls bowling teams finished in second place to add more points to the cup standings.